THIS LISTING IS FOR A PATTERN ONLY; NOT A FINISHED PRODUCT. 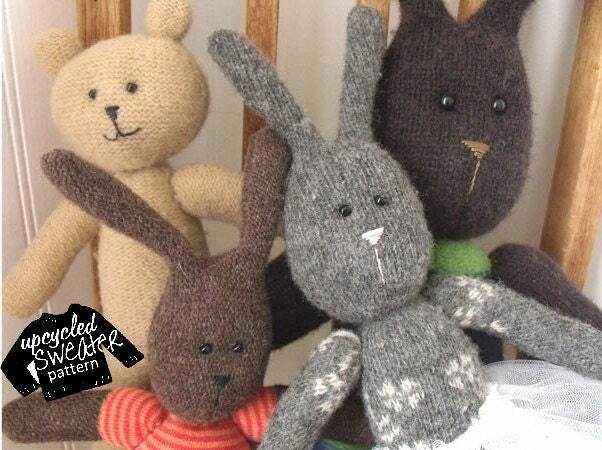 Give your old sweaters a second life and create something cozy, cuddly and fun for the kids to play with. The simple design is perfect for little hands to hold and sweater soft to cuddle with. Large pal is 16 inches tall and mini pal is 10 inches. Both the bear and the bunny are included in the pattern.  Two 1/4 or 1/8 inch black beads for eyes.